Nestled at the foot of the Ozark Mountains and in the heart of the River Valley, Clarksville, Arkansas, is a town of dynamic opportunities. The natural beauty of Arkansas is truly exemplified in our mountains, rivers, lakes, and landscape. Clarksville is centrally located to everything that is great about Arkansas, from wine tasting and fine dining to canoeing, horseback riding, hang gliding and more. Clarksville-Johnson County is widely known for its peaches, scenic byways and abundance of natural outdoor recreational activities. Clarksville is home to the University of the Ozarks, a private, liberal arts based university affiliated with the Presbyterian Church (USA). It is also home to the Johnson County Peach Festival. It is a nearly week long event and attracts visitors from all over the country. Activities and events include barbershop chorus, gospel music, home cooking, handmade arts and crafts, street dance, frog jumping contest, terrapin derby, greased pig chase, a 4-mile run, parade, jam and jelly bake-off and of course peach and peach cobbler eating contests. It all concludes with the crowning of Queen Elberta, Miss Arkansas Valley and Miss Teen Arkansas Valley pageants. 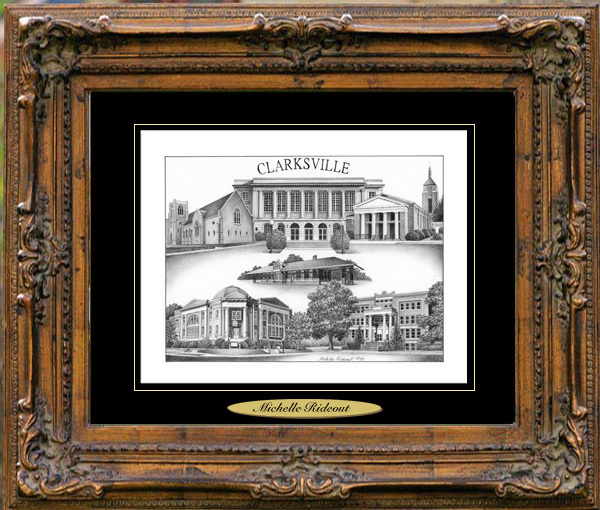 Michelle Rideout, Village Prints artist, has created a beautiful pencil drawing of Clarksville, Arkansas.